Mobile PipeStor. 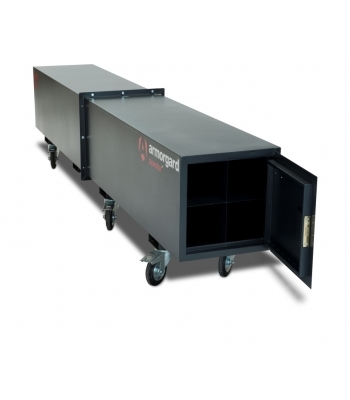 Fully mobile storage trunk designed to keep pipe secure and organised. Keep your expensive pipe locked up on the building site in this portable PipeStor, commonly known as a ‘copper coffin’. This exclusive product is divided internally into four sections for different size pipes and it can be extended to take longer lengths by adding extra sections. Secured on one end with a heavy duty door and lock, the PipeStor sure is an effective way of beating the ‘Copper Thieves’! 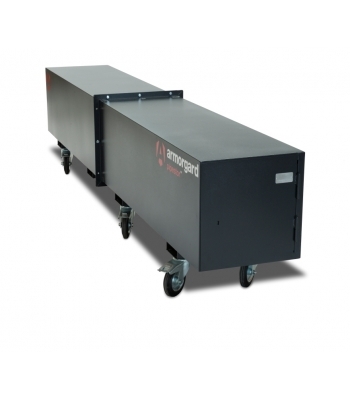 Heavy duty steel construction, Secured with a 5-lever deadlock, Fully mobile - fitted with 6 swivel castors, Extra segments available to extend it from 3m to 6m, Can be easily dismantled and stacked when not in use, Fork lift skids for easy transportation, Serial numbered for replacement keys and locks. Fast delivery, no hassle and cheaper than any competitor I found. All round excellent service. Ideal for what it is designed for but ts quite expensive just to store pipe but our site insisted on these due to constant threat of thieves nicking pipe for the copper.